I'm a big fan of original sources. 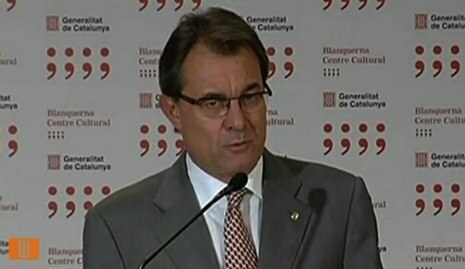 For that reason, I translated the speech that Catalan President Mas gave this morning after his meeting with Spanish President Rajoy, in which Rajoy definitively said no to Mas' proposal of a fiscal pact, which (in theory) would have allowed Catalonia to manage its own tax collecting and spending decisions. As usual with speeches, I have tried to translate as literally as possible, so as to not add any personal interpretations. This results in a text which is somewhat stilted, but in these cases, I think it's more important to maintain a clear fidelity to the original source than to make it sound natively English. You can watch the press conference here. Thanks to the Press Office of the Generalitat de Catalunya (Catalan Government) for giving me a copy of the transcript of President Mas' conference. You can find the original Catalan at the end of this post. Briefly, before going into the topic of the fiscal pact, which is the more significant and important of our meeting today, I wanted also to note that there were two other topics that I put on the table with the President of the Government, and I believe they have their importance, and they're related. One is the topic of the general treasury, liquidity, and to what point the public administrations (local, autonomous, and central) can take advantage of the necessary resources so that payments are as normalized as possible. 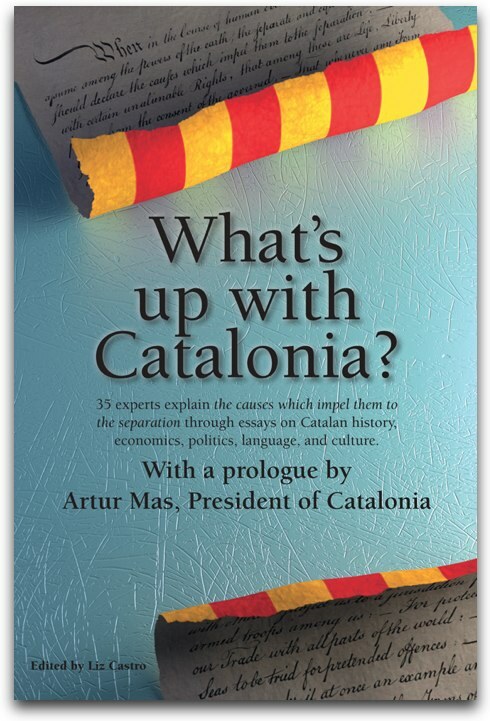 This is a huge, worrying topic that creates a series of negative consequences if they can't be solved correctly and therefore, is a major point of contention for everyone, I realize, not only for the Catalan Government but also for the autonomous governments in general and other autonomous communities, but also for the Spanish Government. The topic came out in all its complexity at this meeting, together with how efforts should be divided throughout the state in order to complete the deficits that have been agreed on with the European Union and the Euro Zone. My belief, that I shared with President Rajoy, is that the central government's efforts with respect to deficit reduction are less than that which they require from the autonomous governments in general and from Catalonia in particular. I gave him some graphic examples: if Spain within the EU was in a worse situation than other countries with respect to controlling the deficit and they have been given more time, how can it be that within Spain, the autonomies that were worse off have not also been given more time, just as was done with Spain, to control the deficit? This situation is clearly unfair. I know that in this sense, there may be criticisms about how things were done in one place or another, but it is obvious that if we want to go in the direction required by the EU and the Euro Zone, reducing deficits and reaching the objectives, the efforts within the Spanish state to even out who does what, in order to coordinate these efforts, must be fair and even, based on certain institutional loyalty. And my opinion is that at this moment, much more is being asked of the Autonomous Communities, which means health care, education, and social services, than is being asked of the central state itself. That's something we have to even out because it's not just that it's unfair, but that it provokes a series of tensions about basic services for the population, that a more equitable division throughout the Spanish State could otherwise avoid. I communicated to President Rajoy that that will be a central theme for me at the presidential conference on October 2. They want to hold a presidential conference next October 2nd, presided by President Rajoy, and I told him in advance that from the Government of Catalonia, I would suggest these topics of treasury and deficit reduction in order to reach a more equitable distribution of these sacrifices which must be carried out between the central government on the one hand and the autonomous communities in general, and in our case, in particular. In this part of the meeting, there were no concrete results, but I would say that the general impression was not negative, in the sense that at least President Rajoy has said that he would study these issues thoroughly and that he understood some of the issues that I presented to him, and thus, there was room to continue speaking about them over the coming days and weeks. We'll see, but at least there was an interest in understanding our positions that can end up coming together in benefit of the rest of the State, because if Spain looks bad, that's also not in its interest. It's in Spain's interest to look as good as it can on the European scene, on the international scene and in the Euro Zone. The other part of the meeting, which was the substantial part, was the fiscal pact. This was the big topic; the others were important, but this was the big, important topic. I will give you a rather graphic summary of how it went: I took office of the Presidency of the Catalan Government, the presidency of our country, of Catalonia, and from the first day, I made it my goal to tell the truth. And I believe that at this moment, it's really important that the government, or those people who hold public positions, tell the truth, because it's the only way to understand each other and the only way to have sufficient credibility to be able to do things that aren't so pleasant, but that the people know are based on truth and transparency, and even if they're not popular, they may still be accepted. This was my code of conduct from my first day in the presidency. Today, I will be true to that way of being, of thinking, and of acting. And thus, what I have to tell you about this other part of the meeting, the fiscal pact, which was the principal topic of today's meeting is that it did not go well. It did not go well and I'll tell you I do not say that happily. On the contrary, I say it with sadness, because I believed that it was important that it went well. I believed that it was important for the relationship between Catalonia and the rest of the State and for the common future of all of us. It was important that the Presidency of the Spanish Government opened the door to enable us to speak in detail about the fiscal pact, and to be able to talk in detail about a hope which is very widely shared by Catalan society. And it's not just about money, but rather about being able to have a different status than the rest of the State and more in tune with our particular political personality and our identity as a country. The autonomic system was born to solve the problem that was Catalonia and the other problem that was the Basque Country, fundamentally to that end, it came from that. And more than 30 years later, those who were unsatisfied with this autonomic system are those that really had a motive for creating an autonomy in the context of the state. The fiscal pact was one of the last attempts to try to make understood the Catalan aspirations of self-government, beyond economic resources, which must be attended to in some way, which must be discussed, which must be negotiated, whose formulas should be able to be improved and not stay exactly the same as 30 years ago, because things have changed and public opinion itself is changing. And, therefore, what we intended was to be able to speak about these things: about these aspirations of self-government and also about the topic of autonomous government resources, with this new perspective. And we called it "fiscal pact" so that it would be understood that our desire was to come to an agreement, if not we wouldn't have called it "fiscal pact", we would have called it something else. And our wish was to be able to understand and to be heard and that we could understand each other and we could move forward and that these Catalan aspirations about fiscal sovereignty could be fulfilled. They are aspirations that are very widely shared by practically all of the political parties, but also by practically the whole of the population. We have an acceptance level of 75-80% of the Catalan population and that's not a small amount. It's practically unanimous, not completely unanimous, but pretty close. The reply from President Rajoy was frank. I have to say that the tone of the meeting was cordial. And I've said it many times, that with President Rajoy, you can't fight with him even if you want to, because he is a pleasant man who treats people affably, and I try to do the same. But President Rajoy's reply was quite frank, he said that there was no room to negotiate a fiscal pact for Catalonia, that the Government had no room and that his feeling was that the statewide parties would feel the same, that neither would they be open to a negotiation about the fiscal pact. No matter how much you want something, if on the other side there is no room—as I was told today— stubbornly insisting on that outcome would be naive, and in my opinion, a big mistake. And therefore, as it was clear that this did not go well, realizing the truth of the situation, it's clear that in Catalonia, we will need to think long and hard about what to do, which we will do in the next few days, and it won't be necessary to wait weeks. Next week, on the 25th, 26th, and 27th, this Tuesday, Wednesday, and Thursday, we have a solemn debate in the Catalan Parliament, which is the general policy debate in which we discuss the previous year as well as the prospects for the future. It is there that I hope that all of the Catalan political forces will take a good, calm, and positive look at the situation, not a grudge match or whining, nothing like that, rather a calm and positive discussion, but also a discussion and a debate on a level in accordance with the circumstances in which our country, Catalonia, currently finds itself. Under these conditions, we can't keep banging our head against the wall because we'll just hurt ourselves. It doesn't make sense to keep insisting on a path when the other side says that that path is closed. And after the debate that takes place in the Catalan Parliament next week, it will be necessary to make some decisions. You will ask me today which decisions, and I will tell you already that I can't answer that today, because I understand that the place for a thorough debate is in the heart of the Catalan Parliament. The situation is delicate enough that it neither deserves nor requires improvisation. It must be thought out well, there must be this thorough analysis, and a shared analysis, where everyone must make their own decisions, and I, as the President of the Country, will do so also. If I had found myself in a situation today in which I heard "it won't work today, but there's a clear opening in a few months that the topic of the fiscal pact might be resolved" I would have undertaken that path. I came with negotiating room and a sufficiently constructive attitude, understanding the situation that the rest of the Spanish state finds itself in in these moments well enough to know that there might not have been results today. But frankly, since what I found was that not today, nor in two weeks, nor in three months, nor four, that the answer is no. There is no room to negotiate with that. Under these conditions, we can't keep banging our head against the wall because we'll just hurt ourselves. It doesn't make sense to keep insisting on a path when the other side says that that path is closed. President Rajoy told me, to explain everything, that there was an open door to continue in 2013 to discuss how to improve the current financing system, the "common regime". That is something that will come, and when it gets here, we'll see what comes out of it, but it's obious that with a simple improvement to the system that's been in place for the last 30 years, Catalonia cannot at this moment fulfill its aspirations as a country, a society, and as a people. And therefore, it is my estimation that this ordinary path, that will come in the usual calendar of things, will be discussed, but it is not the topic that Catalonia was proposing, nor does it take into account—and this is important—the objectives that Catalonia is proposing, nor does it answer to the anxiety of the Catalan people, to the worry, the yearnings and hopes of a huge part of the Catalan people. Therefore, with things as they are, listen: a debate in Catalonia, calm reflection, positive thinking, a look ahead and then decisions. And the decisions will begin specifically next week. Breument i sobretot sintèticament abans d’entrar en el tema de fons que era el pacte fiscal, que és la part més significativa, més important i també més transcendent de la trobada d’avui. Voldria fer notar que hi havia dos altres temes que li he posat sobre la taula al president del Govern i que crec que tenen la seva importància i que van lligats entre ells. Un és el tema de la tresoreria general, la liquiditat, fins a quin punt les administracions públiques (les locals, les autonòmiques, la central) poden disposar dels recursos necessaris perquè els pagaments siguin al més normalitzats possibles. Aquest és un gran tema que fa patir molt en el dia a dia, que provoca moltes conseqüències negatives de màxima si no es pot fer correctament i, per tant, és una tema de màxima preocupació per a tots plegats, em consta també que no només pel govern de la Generalitat sinó també per als governs autonòmics en general i altres CCAA i també per al Govern espanyol. El tema ha sortit amb tota la seva consistència en aquesta trobada, juntament amb com es reparteixen els esforços al conjunt de l’Estat per anar complir amb els dèficits pactats amb la Unió Europea i amb la zona Euro. La meva teoria, que li he expressat al president Rajoy, és que l’esforç del Govern central quant a reducció de despesa és inferior al que s’obliga a fer als governs autonòmics en general i al de Catalunya en particular. Li he posat un exemple molt gràfic: si Espanya a dintre de la UE estava en una situació pitjor que d’altres països per complir el dèficit i se li ha donat més temps, com pot ser que a dintre d’Espanya a les autonomies que estaven en un punt de partida pitjor no se’ls doni també més temps, igual que se li dóna a Espanya per anar complint aquests dèficits. Això és una situació clarament injusta. Ja sé que en aquest sentit hi poden haver crítiques de com s’havien fet les coses en un lloc o en un altre, però és evident que si volem anar cap al camí obligat a la UE i la zona Euro d’anar reduint els dèficits i de complir els objectius els esforços a dintre l’Estat espanyol per equilibrar qui fa què, per anar conjuntant aquests esforços han de ser justos i equilibrats, basats en una certa lleialtat institucional. I el meu criteri és que en aquest moment es demana molt més esforços a les CCAA, que vol dir a la sanitat, a l’educació i als serveis socials, que el que es demana al mateix Estat central. Això hem d’intentar equilibrar-ho perquè no només no és just sinó que provoca una sèrie de tensions sobre els serveis bàsics per a la ciutadania que amb un repartiment més just al conjunt de l’Estat espanyol es podrien evitar. Li he fet entendre al president Rajoy que aquest és un tema central per mi a la conferència de presidents del dia 2 d’octubre. Ells volen fer una conferència de presidents el proper dia 2 d’octubre, presidida pel president Rajoy, i jo li he avançat que des del Govern de Catalunya jo plantejaré aquests temes de tresoreria i de reducció de dèficits per intentar arribar a un escenari de repartiment més just d’aquests sacrificis que s’han de fer entre l’Estat central per un costat i les autonomies en general i en el nostre cas en particular. En aquesta part de la reunió no hi ha hagut resultats concrets però jo diria que la música general no és dolenta, en el sentit que com a mínim el president Rajoy ha dit que ho estudiaria a fons i que entenia algunes de les raons que jo li exposava i, per tant, que hi havia marge per parlar d’això en els propers dies i setmanes. Veurem, però com a mínim he vist un interès per entendre que les nostres posicions acaben sumant en benefici del conjunt de l’Estat, perquè si Espanya queda malament en el seu conjunt tampoc li interessa. A Espanya li interessa queda el millor possible en l’escena europea, en l’escena internacional i a la zona euro. L’altra part de la reunió, que era la substancial, era el pacte fiscal. Aquest era el tema gran; els altres eren importants, però aquest era el tema gran i transcendent. Jo els faré un resum molt gràfic de com ha anat tot això: Jo vaig assumir la presidència del Govern de Catalunya, la presidència del nostre país, de Catalunya i des del primer dia vaig fer el propòsit d’explicar la veritat. I crec que en aquest moment és molt important que des dels governs i des de les persones que tenen o tenim posicions públiques es digui la veritat, perquè és l’única manera d’entendre’s i l’única manera de tenir la credibilitat suficient per poder fer coses que a vegades no són agradables, però que si la gent sap que estan basades en la veritat i en la transparència, encara que no agradin es poden arribar a acceptar. Aquest va ser el meu coi de conducta des del primer dia de la presidència. "No ha anat bé i no ho dic content; ho dic més aviat trist, perquè creia que era important que això anés bé." Avui seré fidel a aquesta forma de fer, de pensar i d’actuar. I, per tant, el que els he de dir sobre aquesta altra part del pacte fiscal, que era el gran tema de la reunió d’avui és que això no ha anat bé. No ha anat bé i no ho dic content; ho dic més aviat trist, perquè creia que era important que això anés bé. Creia que era important per a la relació entre Catalunya i el conjunt de l’Estat i per al futur comú de tot plegat. Era important que des de la presidència del Govern espanyol s’obrís una porta clara a poder parlar a fons del pacte fiscal i poder parlar a fons d’una aspiració que a Catalunya és amplíssimament compartida per la societat catalana. I que no és només un tema de diners, sinó que és un tema de poder tenir un estatus diferent al conjunt de l’Estat i més d’acord amb la nostra personalitat política i amb la nostra identitat com a país. El sistema autonòmic va néixer perquè s’havia de resoldre un problema que era Catalunya i un altre problema que era el País Basc, fonamentalment per això, va néixer per això. I més de 30 anys després els que estan més insatisfets amb aquest sistema autonòmic són aquells que finalment tenien un motiu clar perquè es creés una autonomia en el conjunt de l’Estat. El pacte fiscal era un dels darrers intents per intentar que s’entengués que les aspiracions d’autogovern de Catalunya, a part dels recursos econòmics, d’alguna manera han de ser ateses, que se n’ha de poder parlar, que s’ha de poder negociar, que s’ha de poder avançar sobre fórmules que no siguin exactament igual que en els darrers 30 anys, perquè les coses canvien i la pròpia opinió pública està canviant. I, per tant, el que preteníem era poder parlar sobre aquestes coses: d’aquestes aspiracions d’autogovern i també del tema dels recursos autonòmics, amb aquesta perspectiva nova. I li vàrem dir pacte fiscal perquè s’entengués que la nostra voluntat era de pacte, si no no li hauríem dit pacte fiscal, li hauríem dit una altra cosa. La nostra voluntat era d’entendre’ns i que se'ns escoltés, i que ens poguéssim entendre, que poguéssim avançar i que es pogués arribar a satisfer aquestes aspiracions catalanes quant a la sobirania fiscal. Són aspiracions amplíssimament compartides per part de gairebé tots els partits, però sobretot per part de gairebé tota la societat. Tenim un índex d’acceptació del 75-80% de la societat catalana i no és poca cosa. És gairebé una gran unanimitat, no arriba a una unanimitat total, però s’hi apropa. La resposta del president espanyol ha estat franca. He de dir que la reunió en el tracte personal ha estat cordial. I moltes vegades he dit que amb el president Rajoy encara que vulguis no t’hi pots barallar, perquè és un home agradable i de tracte afable i jo també ho procuro ser. Per tant, en aquest terreny més del tracte personal no hi ha res a dir. "...en aquestes condicions no podem anar picant el cap contra la paret perquè simplement ens faríem mal. No té cap sentit anar insistint en un camí que per l’altra banda és un camí que està tancat." no tenia marge i que ell intuïa que els partits d’àmbit estatal tampoc s’hi posarien bé, tampoc serien propicis en aquesta negociació del pacte fiscal. Per molt que tu busquis una cosa, si a l’altre costat no hi ha marge -com se m’ha dit avui- entestar-se que aquest és el camí seria una gran ingenuïtat i crec que un gran error. I, per tant, constatant que avui això no ha anat sent conseqüent amb la veritat, és evident que a Catalunya caldrà fer una reflexió a fons, que farem els propers dies, no caldrà esperar gaires setmanes. Aquesta mateixa setmana, els dies 25, 26 i 27, dimarts, dimecres i dijous, tenim un debat solemne al Parlament de Catalunya, que és el debat de política general, on es fa balanç de l’any i una mica la prospectiva dels propers temps. Allà espero que hi hagi una reflexió serena i positiva de totes les forces polítiques catalanes, no una reacció de greuge o de victimisme, res de tot això; una discussió serena i positiva, però també una discussió i un debat propi a l’altura de les circumstàncies que està vivint el nostre país, Catalunya. I a partir del debat que es faci al Parlament de Catalunya la setmana que ve crec que caldrà prendre decisions. Vostès em preguntaran avui quines decisions i jo ja els avanço que no els podré contestar avui, perquè entenc que el moment de fer el debat a fons és al si del Parlament de Catalunya. La situació és prou delicada i no mereix ni requereix cap tipus d’improvisació. S’ha de pensar bé, hi ha d’haver aquesta reflexió a fons i ha de ser una reflexió compartida, on cadascú ha de prendre les seves decisions i jo com a president del país també. Si m’hagués trobat l’escenari que avui hagués sigut que avui no pot ser, però hi ha una porta oberta clara perquè en pocs mesos aquest tema del pacte fiscal es pugui resoldre, jo m’hi hauria posat. Venia amb un marge i una actitud suficientment constructiva i entenent la situaciódel conjunt de l’Estat espanyol en aquests moments com per saber que no podia haver-hi resultats avui mateix, però com que m’he trobat que ni avui, ni d’aquí a 15 dies, ni d’aquí a tres mesos, ni d’aquí a quatre, que la resposta és no, no hi ha marge per negociar això, en aquestes condicions no podem anar picant el cap contra la paret perquè simplement ens faríem mal. No té cap sentit anar insistint en un camí que per l’altra banda és un camí que està tancat. El president Rajoy m’ha dit, per explicar-ho tot, que sí que hi havia oberta una porta oberta perquè el 2013 es pogués seguir parlant de com es millora el sistema de finançament actual, el del règim comú. Això és una cosa que ja vindrà i quan arribi ja veurem què dóna de si, però és evident que amb una millora simplement del sistema dels últims 30 anys Catalunya no pot en aquest moment cobrir, ni de bon tros, les seves aspiracions com a país, com a societat i com a poble. I, per tant, entenc que aquest és un camí ordinari, que tocarà quan arribi el moment, ja se’n parlarà, però no és el tema que plantejava Catalunya, ni cobreix- insisteixo- els objectius que es plantejava Catalunya, ni respon al neguit de la societat catalana a la preocupació, als anhels i a les il·lusions d’una gran part del poble de Catalunya. Per tant, com que les coses estan així, escolteu, debat a Catalunya, reflexió serena, mirar cap endavant i decisions. I les decisions a partir, concretament, de la setmana que ve.